Ever just need a sauce to add flavor to plain food, or bring several different elements together into one meal? Does a chocolate chili sauce sound interesting? When you think about it, many of our favorite dishes are defined by the sauce. Classic French cooking, of course, is famous for the use of sauce, but it is not alone. We say spaghetti and meatballs, but the dominant flavor is really the seasoned tomato sauce. Sauce holds casseroles together. Enchiladas do not exist without the chili sauce. Gravy is, in fact, a thickened meat sauce, and we pour it over roast meat and mashed potatoes. The concepts come together in sausage gravy – a white sauce made with sage sausage, poured over biscuits. And this seems to be the second greatest frustration – after bread – for people who have had to go gluten free. Many of us are used to grabbing a can or packet for a quick sauce to pull a meal together – and now we read labels, and put that can back on the shelf… and wonder what to do. Those of you who read my What I Ate Wednesday posts may have noticed that this winter, instead of soup, I frequently eat a rice bowl for lunch. Turns out to be very convenient – precooked rice (or other grain, but I most commonly have rice) with some combination of leftover meat, tofu, or beans, and either leftover or frozen vegetables. And, depending on how that food is seasoned, and to some degree the mood I’m in, that may be fine. But all by itself, it might also be a little… bland. Or even a little dry. Rich, particularly, isn’t fond of plain rice, so even if I don’t want something else, he’ll douse his with soy sauce, or put salsa on the side… Something. 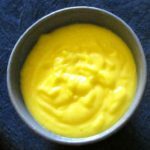 So I’ve been experimenting with make ahead sauces – something I can keep in a jar in the fridge and spoon over our food. Sometimes it’s as simple as compound butter – the fresh herbs (usually parsley) I blended into butter and froze last summer. Later, in spring and summer, I’ll make Sorrel Sauce, Rhubarb Sauce, Salsa Verde, and other wonderful sauces with fresh herbs and vegetables. Right now, though, I’ve done several variants on Peanut Sauce. 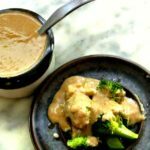 It’s exactly what I need for the grain bowls – it cooks quickly, stores and reheats well, adds protein and, well, body to the meal (perfect when I have Not Quite Enough leftover meat…) I have found I like to keep a jar of some sort of peanut sauce on hand – it’s just too useful. 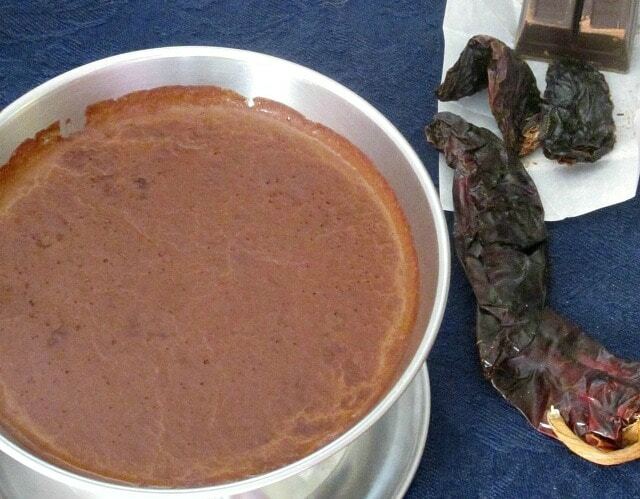 Then, in February Chocolate Season I found myself thinking about savory uses of chocolate – such as mole sauce. Chocolate, chilies, other spices… wait – sometimes thickened with ground nuts? That’s an idea… So I played with that. Now, as always, the authenticity disclaimer – this is not mole sauce. 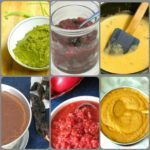 It’s my own invention, loosely inspired by Mexican sauces with bitter chocolate and hot chilies, and the peanut sauce I was already making (which was in turn loosely inspired by Indonesian peanut sauce…) It all came together as a Chocolate Chili Peanut Sauce. I used two ounces of baking chocolate. This is the bitter chocolate, not dark chocolate (which is sweetened, and which would affect the balance of flavor.) 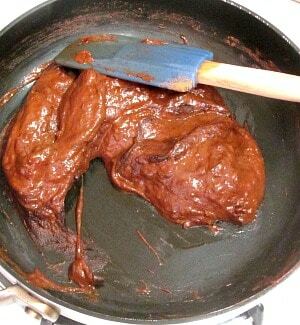 Then, instead of fooling around with soaking and pureeing dried chilies (even though I sprinkled them artistically around the picture) I chose to use the pureed chipotle in adobo, which I generally have on hand, because I like the complexity of the flavor as well as the ease of use. 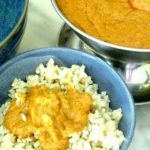 Three tablespoons gave me good flavor, and a little tingle of heat, but was not seriously hot – you may certainly use more if you want something really spicy. I also added cinnamon, for another layer of flavor. Normally I tell you that, for home cooking, it makes sense to learn to prep foods while other foods cook. This is not a commercial kitchen, and we have different needs. This time, though, I’ll tell you to set up your mise en place – have everything out, measured, and ready to use. Chocolate can burn if you pause at the wrong moment, and we don’t want that. So measure out two cups of water, and half a cup of peanut butter and set them on the side, ready to go. Oh, and the peanut butter must be Natural Peanut Butter – nothing but peanuts and perhaps a little salt. Stabilizers and hydrogenated fats will mess up the recipe. 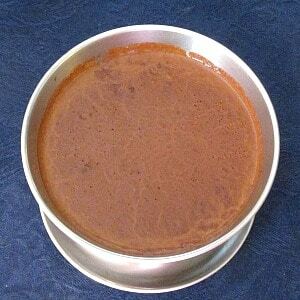 Put the chocolate, the pureed chipotle, a tablespoon of cinnamon, some salt, and about a quarter of a cup of that water into a heavy pan over low heat. (I usually use a saucepan – chose the skillet for the pictures because you can see it better.) Stir it until the chocolate melts, and the mass starts to come together smoothly. 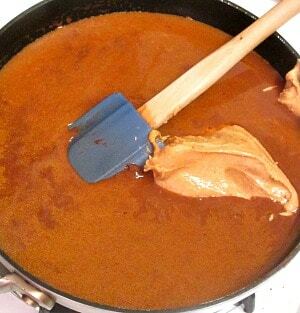 As soon as it does, start to stir in about another cup of water, about a third at a time, so you keep a smooth sauce. Then stir in, alternately, some of the peanut butter, and some of the water, until it is all blended in. Once it is completely amalgamated, you can raise the heat very slightly, and continue stirring as it thickens. You can bring it just barely to a simmer, but don’t let it boil. It can thicken abruptly and do a terrific imitation of bubbling lava – you don’t want it to spatter like that. The whole process takes about ten minutes, possibly as long as fifteen… and there you have it. You can use it at once, poured over a rice bowl, but the real advantage is that it keeps and reheats well. Let it cool, and then refrigerate. It thickens more, so you sort of scoop out a blob… I drop it on top of a rice bowl and then microwave it all – super easy and fast lunch. But I also scoop some into the water in which I braise chicken, or plop a little on top of hot rice and stir it right in, or add a bit to vegetable soup that needs a little… something… It is remarkably versatile. 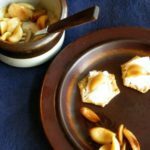 This recipe makes close to three cups, because I like to have enough – but you can easily divide it in half, if you want. 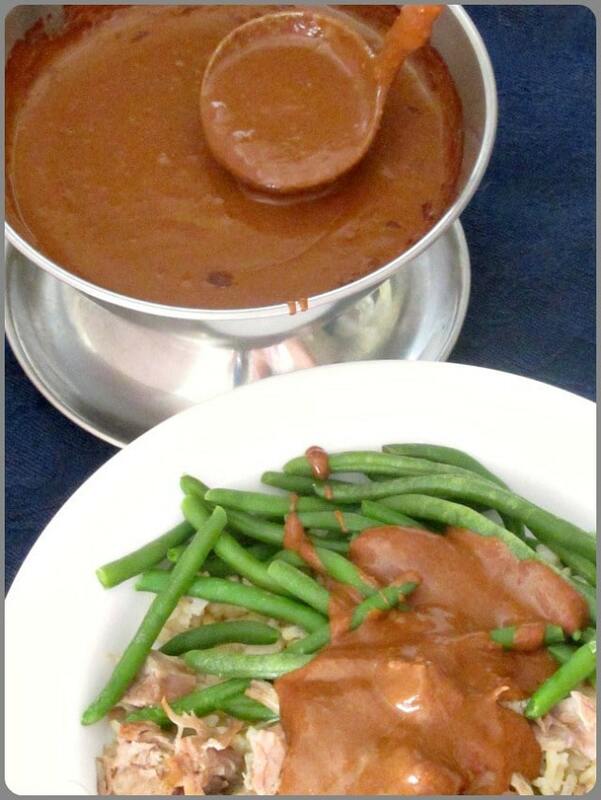 And keep those lunches interesting, with Chocolate Chili Sauce! Need a sauce to add flavor to plain food, or bring several different elements together? Does a Chocolate Chili sauce sound interesting? Gluten free, vegan. 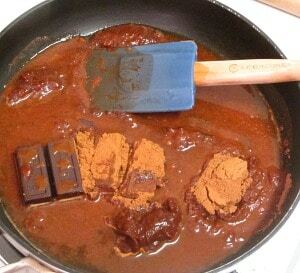 Put chocolate, chipotle, cinnamon, salt, and 1/4 c water in a heavy pan over low heat. Stir until chocolate is melted and everything starts to come together smoothly. Immediately add more water, about 1/3 c at a time, and stir after each addition, until you have a smooth sauce. Then add half the peanut butter, stir in, half the remaining water, stir, then the rest of the peanut butter and the rest of the water. Stir until smooth. Continue stirring over low heat until the sauce thickens. Store remaining sauce in the refrigerator, as it both keeps and reheats well. This sauce sounds so delicious! Yum! Thank you! We really like it. Wow! What an interesting flavor combo. I love the idea of this sauce.